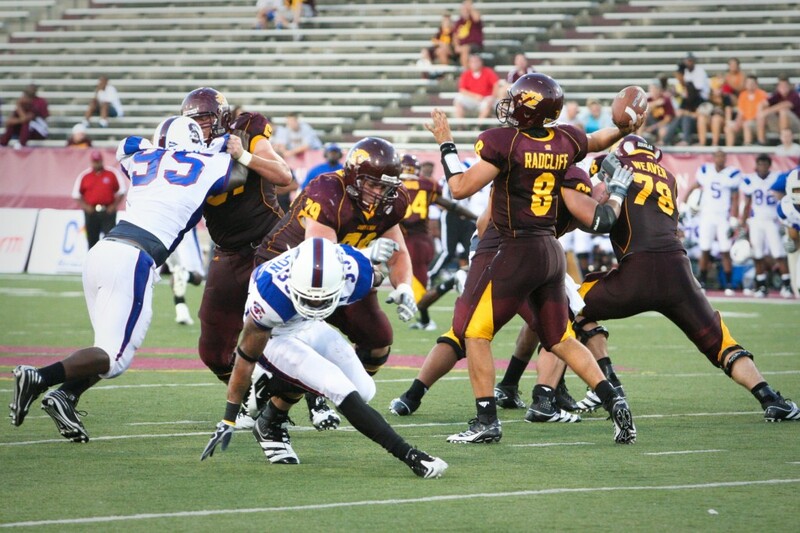 Big plays propel Central Michigan to 21-6 victory over South Carolina State | Grand Central Magazine | Your Campus. Your Story. Central Michigan defeated South Carolina State 21-6 in their first contest of the season. 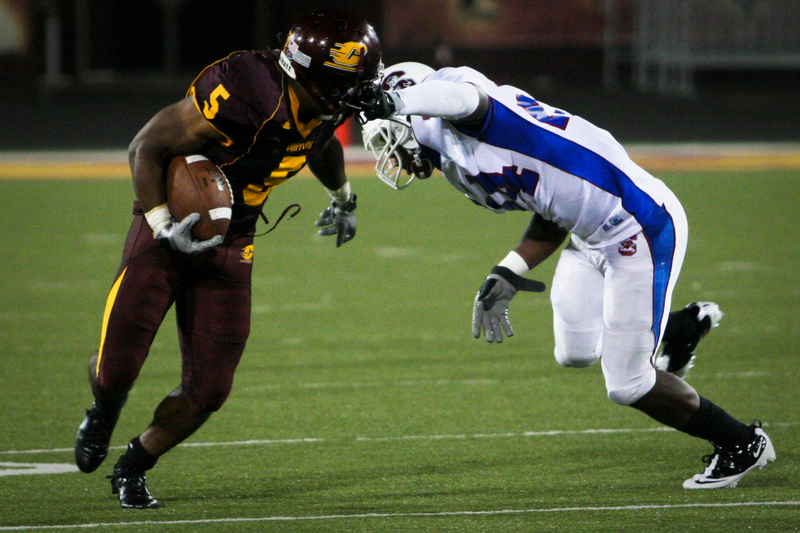 Central Michigan defeated South Carolina State (SC State) 21-6, in what may have been a case of first week jitters. 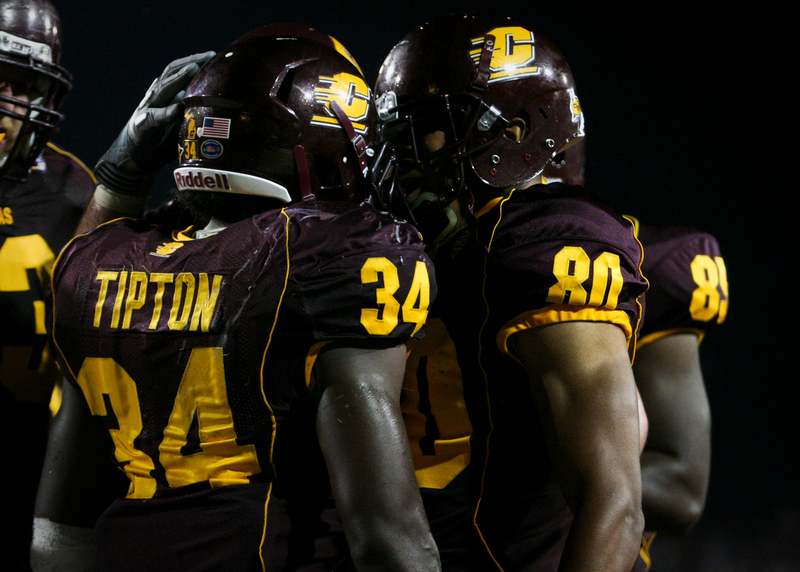 The Chippewas struggled to consistently execute on offense, as they never really found a rhythm. Head Coach Dan Enos didn’t sugarcoat Central’s performance and cited poor quarterback play by junior quarterback Ryan Radcliff. Radcliff looked good on the first drive of the game, throwing a 45-yard strike to junior wide receiver Cody Wilson for his first touchdown but was rather shaky throughout Thursday’s contest. Radcliff did face stiff pressure for much of the first half and some of his ineffectiveness could be attributed to that, as he passed for 168 yards passing and two touchdowns, completing 14 of 27 passing attempts. “I don’t think Ryan ever got in rhythm,” Enos said. “I thought he was in rhythm after the first drive and then after a couple of three-and-outs, things started to tighten up a little bit. The redshirt junior struggled in his first in-game action since last fall but his favorite target on offense isn’t concerned about his quarterback. Wilson said no player can have a great game every week and that was the case for Radcliff on Thursday. Central’s offense looked bottled up for most of the game but big first half plays from Radcliff and the passing game gave the Chippewas the early lead. After the Wilson touchdown and a 41-yard field goal by SC State’s Blake Erickson in the first quarter, Radcliff hooked up with freshman wide reciever Titus Davis in the second quarter for a 67-yard touchdown pass. Davis was running a downfield pattern and adjusted on the fly, stopping mid-route and coming back to the ball, as an SC State defender’s momentum carried him up field. 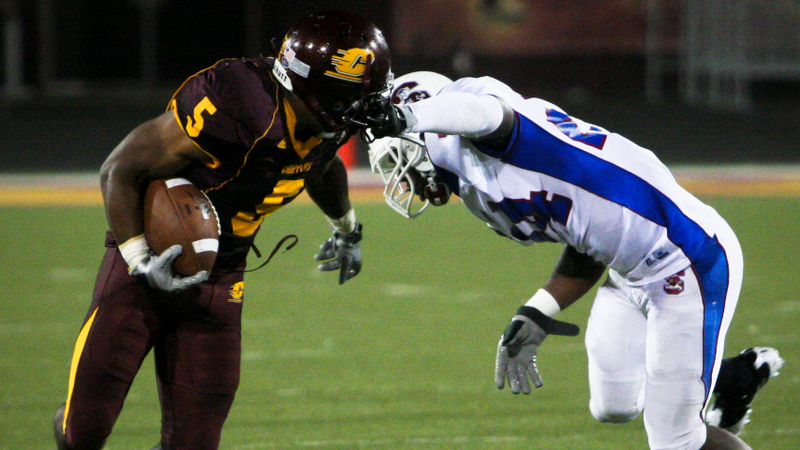 After Davis’ touchdown and another Erickson field goal for the visitors, Central led SC State 14-6 at the half. Central opened the second half with a 12-play, 53-yard drive that took 6:37 off the clock and was punctuated by sophomore halfback Zurlon Tipton‘s spectacular one-yard dive into the end zone. Tipton and the other two running backs in the Chippewas’ trio, Paris Cotton and Tim Phillips, were far more successful on the ground in the second half as Central made a commitment to run the ball after little to nothing worked on offense in the first half. Tipton carried the ball 18 times for 73 yards rushing and the touchdown, as well as showing impressive speed in the return game for a 220-pound back, gaining 99 yards on three returns. Add two receptions for 14 yards and the sophomore out of Detroit had 199 all-purpose yards on the night. Central’s defense was impressive against the very unpredictable SC State offense that featured a lot of horizontal run plays via pitch and quarterback keepers out of the shotgun. The defense allowed a paltry 137 yards of offense during the game, even holding SC State to -19 yards during the fourth quarter. Four players had six or more tackles on defense, after three starters in the linebacker corps went down with injuries. The extent of the injuries are unknown to this point for Mike Petrucci, Shamari Benton, and Armond Staten, all of which did not return after injuries. Central will travel to Lexington, Ky. next week to take on an SEC opponent, the Kentucky Wildcats, for the first of three straight road games. 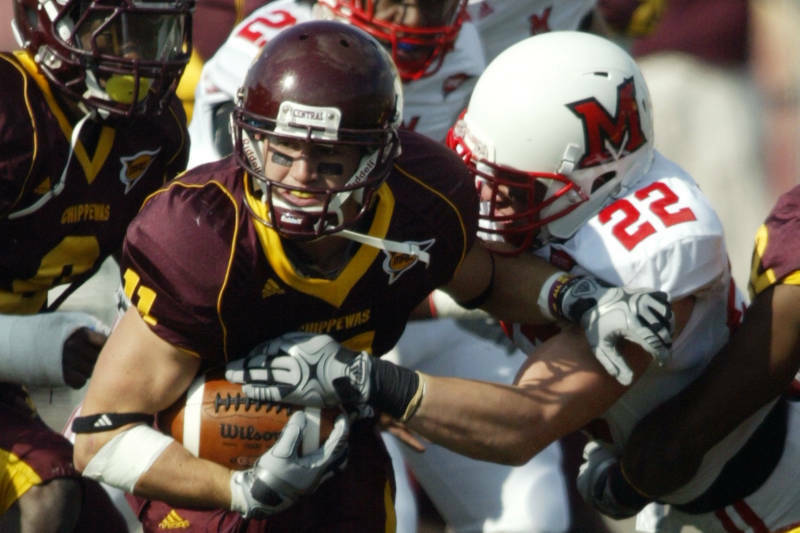 The Chippewas will return to Kelly/Shorts Stadium on Oct. 1 when they will play the Northern Illinois Huskies. GCMAG.org’s Photo Gallery from the game. Separator image Posted in Athletics, Food & Wellness and tagged with Alek Frost.